(ゾウなどの)きば 《★【類語】 ⇒fang; cf. →ivory 1》. 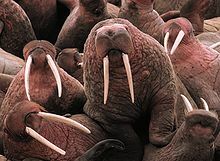 From Middle English tusk (also tux, tusch), from 古期英語 tūx, tūsc (“grinder, canine tooth, tusk”), from Proto-Germanic *tunþskaz (“tooth”), extended form of Proto-Germanic *tanþs (“tooth”), from Proto-Indo-European *h₃dónts (“tooth”). Cognate with Saterland Frisian Tusk (“tooth”), West Frisian tosk (“tooth”), Icelandic toskur (“a tusk, tooth”) (whence the Old Norse かつ Icelandic Ratatoskr かつ Ratatoskur respectively), Gothic 𐍄𐌿𐌽𐌸𐌿𐍃 (tunþus, “tooth”) and *𐍄𐌿𐌽𐌳𐌹 (*tundi, “thorn, tooth”). More at tooth. One of a pair of elongated pointed teeth that extend outside the mouth of an animal such as walrus, elephant or wild boar. Until the CITES sales ban, elephant tusks were the 'backbone' of the legal ivory trade. A small projection on a (tusk) tenon. (carpentry) A projecting member like a tenon, and serving the same or a similar purpose, but composed of several steps, or offsets, called teeth. The share of a plough. To dig up using a tusk, as boars do. To gore with the tusks. (obsolete) To bare or gnash the teeth. “tusk” in Douglas Harper, Online Etymology Dictionary, 2001–2019. A fish, the torsk (Brosme brosme).